Michelle Lieberman and Gal Mariansky didn’t grow up farming, but after many years of home gardening, volunteering on farms, and helping with urban gardening programs, the farm dream had firmly taken root. 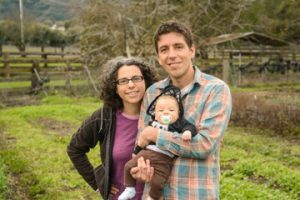 In 2009, they bought an acre of land on the outskirts of Morgan Hill, CA, and began converting it into a farm. The vision was to create a diversified vegetable farm delivering sustainably grown produce to the local community. They particularly liked the CSA model (i.e. vegetable subscriptions for farm members) because it fosters a sense of connection between the farm and its members and helps families learn about seasonal foods. 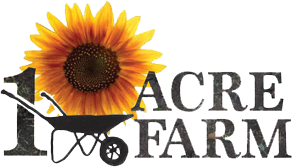 Today, about 30 families belong to the One Acre Farm CSA each season, receiving a wide variety of produce from spring through fall. Michelle and Gal are still in awe of the a daily learning experiences of farming and are often immersed (literally!) in lessons about soil, climate, water, insects, construction, food preservation, and much more. The newest family member, Avi, arrived in 2015 and is already showing an interest in farming, especially harvesting strawberries. The Produce: We grow about 60 different types of produce throughout the year. 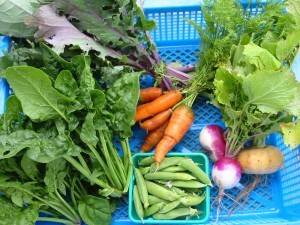 Each week our CSA members receive a selection of the farm’s best seasonal vegetables and fruits. We take great pride in growing the most flavorful produce, and because it’s all hyper-local, it gets to our customers at the peak of ripeness and freshness. Many of the varieties of produce we grow are heirloom types that not available in grocery stores. We use sustainable farming methods and never use GMOs or synthetic fertilizers, pesticides, or herbicides. Spring and Fall: Lettuce, Peas, Bok Choy, Fava Beans, Salad Mix, Artichokes, Cabbage, Broccoli, Leeks, Kale, Swiss Chard, Mustard Greens, Collard Greens, Arugula, Napa Cabbage, Kohlrabi, Turnips, Spinach, Winter Squash, Pumpkins, Cauliflower, and Herbs. Summer: Tomatoes, Bell Peppers, Eggplant, Summer Squash, Carrots, Green Beans, Basil, Corn, Cucumbers, Garlic, Onions, Melons, Beets, and Fresh Herbs. Occasionally, we offer other goodies such as fresh fruit, sun-dried tomatoes, dried herbs, wheat berries, and more!